In this demo, we present a simple demo robot with all components from publishing joint states over publishing fake laser data until visualizing the robot model on a map in RViz. We assume your ROS2 installation dir as ~/ros2_ws. Please change the directories according to your platform. To start the demo, we execute the demo bringup launch file, which we are going to explain in more details in the next section. Parsing robot urdf xml string. If you have a closer look at the launch file, we start a couple of nodes at the same time. The first two packages are relatively simple. The dummy_map_server constantly publishes an empty map with a periodic update. The dummy_laser does basically the same; publishing dummy fake laser scans. The dummy_joint_states node is publishing fake joint state data. As we are publishing a simple RRbot with only two joints, this node publishes joint states values for these two joints. The robot_state_publisher is doing the actual interesting work. It parses the given URDF file, extracts the robot model and listens to the incoming joint states. 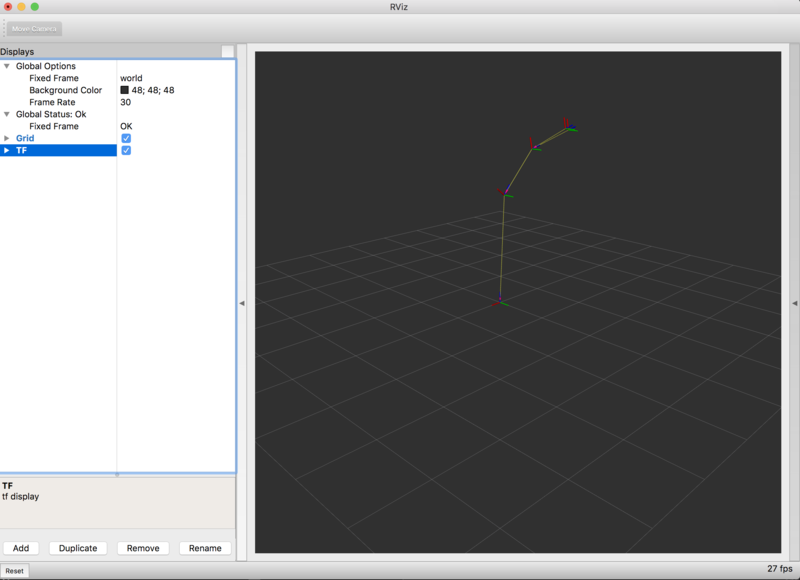 With this information, it publishes TF values for our robot which we visualize in RViz.